Zoya Akhtar’s strength, evident in her last two films, has been her fly-on-the-wall perspective – the ability to observe the foibles and faults of her characters, without over-explaining them. In her third film, “Dil Dhadakne Do”, she chooses not to observe but preach and tell, and gives up her biggest strength. Akhtar chronicles the lives of an affluent Delhi family that lives in luxury but harbours middle-class attitudes about marriage and family. A cruise to celebrate Kamal and Neelam Mehra’s (Anil Kapoor and Shefali Shah) 30th wedding anniversary serves as an occasion for the family to come together. But once the ship sails, the façade of a happy family comes undone pretty quickly. Whether it is their daughter Ayesha’s (Priyanka Chopra) marriage to straitjacketed, closet chauvinist Rahul Bose or their son Kabir’s (Ranveer Singh) complete lack of interest in the family business or the girl they have chosen for him, the Mehras are oblivious to the obvious. Wrapped up in their own problems and too busy keeping up the farce of a happily married couple, they skim over important issues and focus on petty ones. In one of the film’s best scenes, Kamal Mehra asks his daughter why she wants to divorce her husband when they are both Punjabi, young, doing well for themselves and even play the same sport. Incompatibility or lovelessness is beyond his comprehension. 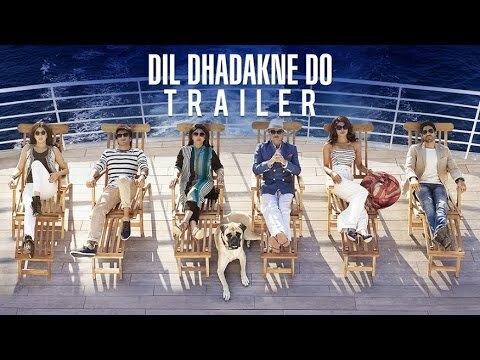 In such moments of brilliance in “Dil Dhadakne Do,” Akhtar chooses to show rather than tell. During most of the film though, she chooses the other way round, employing the family’s solemn-faced bulldog Pluto as a narrator. Aamir Khan, voicing Pluto, delivers condescending homilies about love, women’s freedom and living life to the fullest, which appears to be a throwback to his “Satyamev Jayate” TV series. The hurried manner in which Akhtar and co-writer Reema Kagti wrap up all loose ends is what makes the film unravel. For all their perfectly coiffured hair and designer clothes, the lives of this privileged set are as messy as the most, but Akhtar straightens them out with minimal effort, almost like a super-efficient butler. The Mehras are supposed to be a dysfunctional family, but their troubles disappear without much effort, leaving you to wonder if they were really that dysfunctional in the first place. The marriage of Kamal and Neelam, for example, needs just one incident to get back on track and years of discord disappear in an instant. Other side-plots are also disposed off summarily, including another romance. Most of the time is devoted to Kabir and his love story with Farah Ali, a dancer on the cruise (Anushka Sharma, with whom he shares crackling chemistry). Thanks in no part to Singh’s endearing performance as the rudderless son who finds purpose when he falls in love, it is Kabir that the audience ends up cheering for. In the film’s only confrontation scene between Kabir and his parents, Singh proves he is head and shoulders above his contemporaries in Bollywood today, using both comic timing and a sense of drama in his performance. Matching Singh scene to scene are Kapoor and Chopra, who slide into their characters with great ease. This is Akhtar’s weakest film yet, because she tries to tell too many stories at once and tells none entirely. Besides the performances, what keeps this ship afloat is the cinematography. Carlos Catalan’s camera is the actual fly on the wall that tells you everything you need to know about this poor little rich family. Never saw a good review from you.